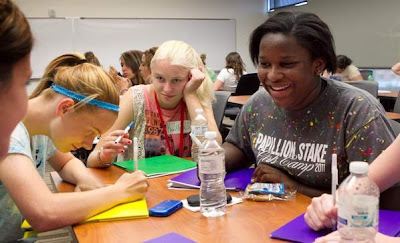 Nebraska's World Herald reports that at “Cookie University,” a three-day program at the University of Nebraska at Omaha, 21 high school-aged Girl Scouts learned how the skills gained from the Girl Scout Cookie Program translate into college and careers. The program, now in its second year, is sponsored by the Spirit of Nebraska Girl Scout Council at no cost to the Scouts or their troops. Cookies and cookie selling were not the focus. It's not a seminar to help Scouts boost sales. Plus, it's fun to spend time on a college campus with other girls, said Jenna Podany, 15, a high school sophomore from Clarkson, Neb., sitting with Kylie Congdon, 14, and Melinda Union, 15, two girls she just met from Conestoga High School in Murray. UNO faculty and staff taught classes on credit-card management and budgeting but also provided information about extracurricular activities and services offered at college. Gamble seemed a little stunned after a budgeting session, in which finance, banking and law professor Kath Henebry guided the Scouts in identifying the expenses of daily life — food, housing, car expenses, insurance, even the cost of caring for pets — that should be included in a budget. The budget session followed one on the pitfalls of credit cards.